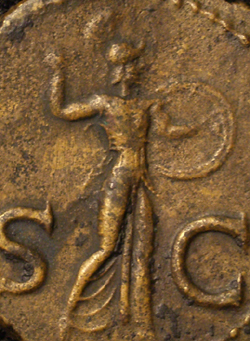 Reverse: Minerva standing right brandishing spear and shield - S.C. This is a beautiful As of The emperor Claudius. The notches were most likely made in antiquity for the coin to possibly be worn as jewelry or decoration. The forth Roman Emperor Claudius was born in A.D. 10 in Lugdunum (in Gaul) third child of Nero Claudius Drusus and Antonia Minor, Grandson of Mark Antony and Octavia Minor (Caesar Augustus' sister) and paternal grandson of Livia, (Augustus' third wife) and Tiberius Claudius Nero. "His knees were weak and gave way under him and his head shook. He stammered and his speech was confused. He slobbered and his nose ran when excited." Suetonius also notes that when calm and seated he was a tall, well-built figure of dignitas. When angered or stressed, his symptoms became worse. Claudius himself claimed that he had exaggerated his ailments to save his own life. Whatever the cause of his ailments they are largely accredited as the reason behind Claudius's long life and survival in a family that is legendary for intrigue and murder. With a twitch, a limp, and a stutter Claudius was deemed harmless as long as he was out of the public eye. Little is known about Claudius before he took the consulship under his nephew Caligula due mostly to his own family's wishes to keep him from the public eye. It is known that he did not waste that time but used it to study history and language and wrote quite extensively on the reign of Augustus, the History of the Etruscans and of Carthage among other works that do not survive today. Claudius had not been raised to rule but it can be said that he was privy to much of the inner workings having been raised around the courts of the previous, and first three, Emperors. He was not unfamiliar with the workings of empire, government and law. In fact it seems he took to imperial power rather easily and soon found himself very active in the workings of all aspects of Roman government, law, and military once he was proclaimed emperor by the praetorian guard after the assassination of his predecessor and Nephew Gaius Caligula. In the end Claudius is a rather enigmatic ruler and the picture painted seems different depending on the source one reads. Boorish, Cruel, paranoid, dull witted, easily confused, easily angered (to which he acknowledged and apologized for) and easily controlled by his freedman and wives is one view. Intelligent, well-read, able and a diligent, mostly fair minded administrator is another. The truth is probably somewhere in between. He took to the purple with enthusiasm and a sense of hands on duty that found him in the courts and conducting business almost everyday. Under his rule the empire expanded with Claudius's incentives to colonize and expand as well as with the annexation of the provinces of Thrace, Mauretania, Noricum, Pamphylia, Lycia, and Judea. 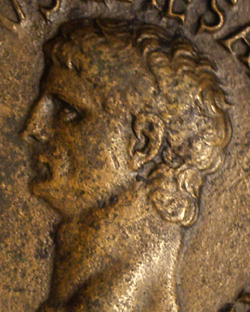 Claudius himself went to Britain and was given the name Britannicus in which he passed on to his son. He embarked on ambitious building projects building two aqueducts and repairing others as well as building new roads and canals . He sought to settle disputes in the provinces and was very active in the courts, for good or bad (depending on the source), he was very much involved with the day to day business of the legal system. 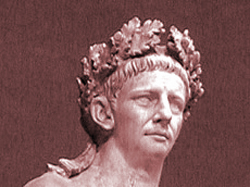 After a series of failed marriages ending with a spectacularly lurid failed marriage to Valeria Messalina involving treasonous acts and debauchery leading to the death of Messalina and company, Claudius married Agrippina the younger his niece and Caligula's infamous sister and mother of the future emperor Nero. Agrippina had participated in Caligula's debauched reign, his questionable relations with his sisters, and she was no stranger to intrigue, deception and a lust for power. At Agrippina's request, Claudius adopted her son Nero putting in question his own sons succession. This may have been the act that sealed the fate of Claudius. Agrippina is said to have been the driving force that isolated Britannicus and promoted Nero and in the end she may have poisoned Claudius in the grand tradition of the Julio-Claudian women to insure a place for her son as emperor. Upon Claudius's death in A.D. 54 there was little standing in Nero's way from taking power which he indeed took. Britannicus survived his fathers death only a few months. Claudius was succeed by Nero.